After an almost 4 hour journey from Caramoan, we were back in Naga City. We asked the van driver to let us know where we should alight to go to CWC in Naga City. The driver stopped at a 7/11 convenience store and told us we could ride a tricycle there and tell the driver to bring us to CWC. If riding a bus or a jeepney, tell the driver you are going to Capitol or Kapitolyo. There you could hire a tricycle at Php 10/pax. The place is called Kapitolyo because it is where you could find the municipal hall and other government offices in Naga City. Can you go to CWC even if you will not do wakeboarding? Of course! There is no entrance fee in CWC. However, if you will just watch those who are wakeboarding and wish to be seated near the lagoon, out of courtesy, at least buy something to drink or eat. The food in CWC is not too expensive and the servings are huge. We ordered 3 Cheese with Roasted Garlic Pizza and Pork Barbeque with rice and some sodas. 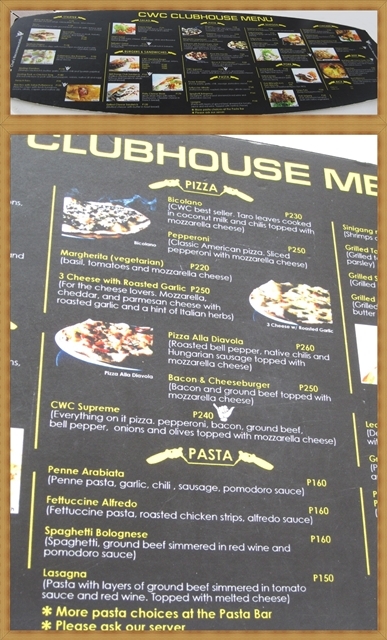 If you wish to try something different, they have a Bicolano (or laing) pizza. Laing is a local delicacy in Bicol that has taro leaves stewed in coconut milk and chili. Bicolanos are known for spicy dishes, most of which are infused with coconut milk. Here's their 2-pc. Barbeque with Java Rice. The serving is big enough that you could just order another rice and it will be good for two! I love their pizza! Thin-crust pizza with Garlic and Mozzarella, Cheddar and Parmesan cheese. Yeah, it's the CHEESY me again. Their pool is big enough., but it seems that people here are more interested in watersports than having a dip in the pool. This is their snack bar where you could order some tummy filling pica-pica or even rice meals! They also have sumptuous desserts. If you will go wakeboarding, there are a variety of equipment available for rent. The good news is, if you are a group and wants to have an extreme adventure in CWC, they have an ongoing promo. Promo is until November 30, 2011, so you have still have a month to tag your friends along! After lunch, we headed back to SM Naga to buy some pasalubong (Suspiros de Pili, Pili Tarts, Shirts, etc.). Then we rode a bus bound to Lagonoy and alight at the corner going to the airport, where we hired a pedicab at Php 15/pax. That ends our Bicolandia birthday bash. 'Til next year!